What tools do you need to do a perfect an Argentinean parrilla? 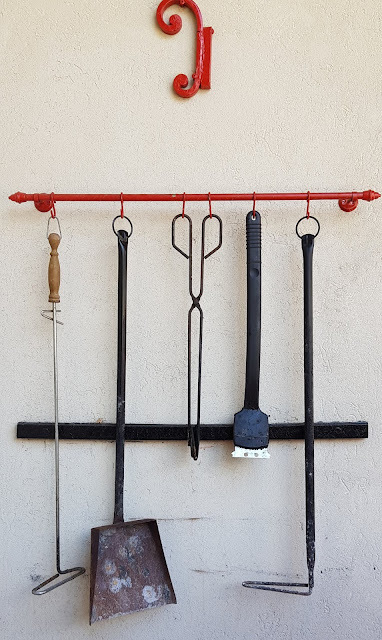 There are number of basic tools that you need to have close to the parrilla for maintaining the fire and the grill. To manage the fire, you have the fireplace poker to move the coals around and manage the temperature. The small shovel helps to move larger amounts of coal in the parrilla. The tong helps to move larger pieces of wood to the brasero or position the larger coals better. And a brush is needed to clean the parrilla before and after use. It is important that after using the grill, you quickly pass the brush over the metal, but without rubbing it too heavily to keep the crease on the grill. That will avoid rust and oxidation of the grill when not in use. When using it again, you clean it properly with a newspaper, the brush and some meat crease. For the asado itself you need to get a long spatula that reaches the back of the parrilla and a long fork. The parrilla fork o tenedor en Spanish is also long to get the meat from the back and has a release mechanism to take off the meat once ready. There are different mechanisms, but it needs to be one with a spring and a trigger that can be pulled with your index finger. But the most important equipment is obviously the knife. The asador will always proudly show his knife. And there are many types, materials and sizes, so we give here some guidance to help. First of all the size that varies between 10 and 25 cm of blade length. The most common length is 20 cm and is ideal for a typical asado where pieces are well sized. A 25 cm is better for even larger parts of meat, but maybe get too large for most common cuts. A smaller length would not be able to cut through the asado meat, and is better equipped for detail cutting. The picture shows two knives of 15 cm blades below, a 20 and then another two with 25 cm length. The parrilla knife used is typically a sharp blade without any teeth. It is a meat knife and there are modern as well as traditional types to use. 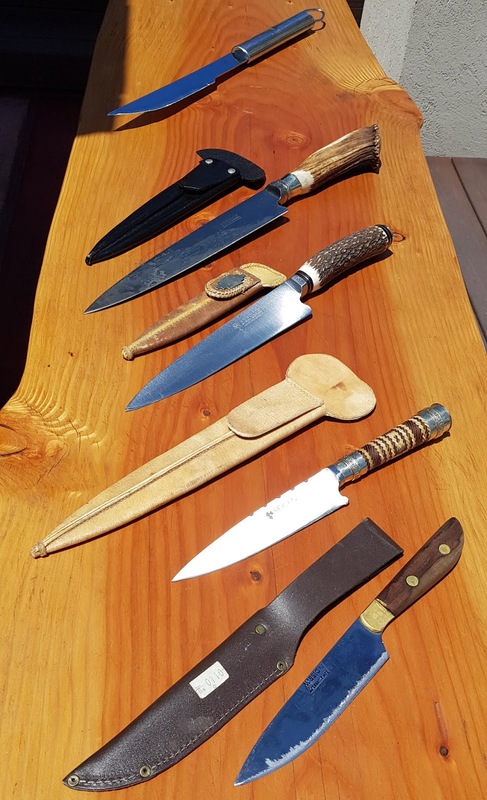 To choose between a modern or more traditional knife is a choice of religion, A modern stainless steel knife is shown in the top of the picture. It is light, easy to handle, but looses its sharpness and its blade bends when cutting harder parts of the meat. You can see that they are really crafted beautifully and are considered as jewelry in the family, some of them even being inherited from father to child. The metal hardness depends on the brands, but one of the famous brands are the the Arbolito knives known for its carbon metal hardness and having a long Argentinean legacy of knife making. Comparing the blades of a carbon hardened metal Arbolito Criollo knife compares to the modern stainless steel knife on the right, the width of both knives clearly stands out.The Arbolito knife is well balanced, can be sharpened easily, strong, and gives some extra weight to cut through bones as well. To maintain it from rusting and oxidation, you need to keep the knife creased after use. Just wiping it off with a bread is sufficient to store it and clean it properly when using it again. It is a real jewel.